The Logic Controls TD3200 Series has been discontinued. No direct replacement is available. Compact, efficient, and reliable make this a great addition to any POS environment. Logic Controls customer displays are widely known as the market leaders for PC-based POS systems. They have long set the standard for reliability, value and functionality reasons why most value-added resellers ask for Logic Controls displays by name. One of the reasons why Logic Controls pole displays are the market leaders is because of their well deserved reputation for unsurpassed reliability. The TD3000 uses special display technology and unique circuit design to achieve this reliability. The TD3000 is a 2x20 line 5 mm character height table top display that comes with much functionality that simply is not found in other vendors displays. Smart scrolling, vertical scrolling, and a built-in real-time clock are all standard features of the unit's firmware. The TD3000 comes with a wide variety of interfaces, can emulate many popular command sets, and has better visibility due to an optically matched lens and wider character pitch. Best of all, this premium pole display is also one of the most affordable on the market. 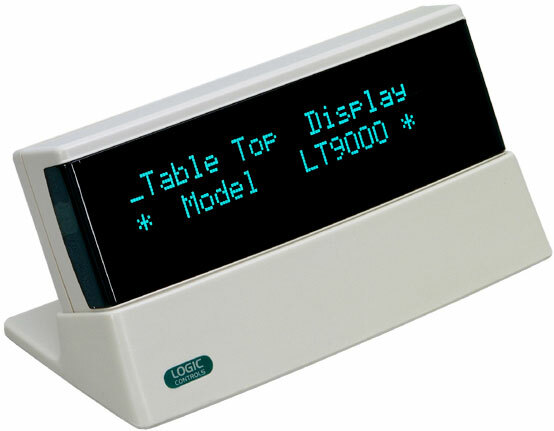 Table-Top Display TD3000 Series More Images The Market Leader Logic Controls customer displays are widely known as the market leaders for PC-based POS systems. They have long set the standard for reliability, value and functionality – reasons why most value-added resellers ask for Logic Controls displays by name. Proven, Time-Tested Reliability One of the reasons why Logic Controls’ pole displays are the market leaders is because of their well deserved reputation for unsurpassed reliability. The TD3000 uses special display technology and unique circuit design to achieve this reliability. Advanced Functionality and Value The TD3000 is a 2x20 line 5mm character height table top display that comes with much functionality that simply is not found in other vendors displays. Smart scrolling, vertical scrolling, and a built-in real-time clock are all standard features of the units firmware. The TD3000 comes with a wide variety of interfaces, can emulate many popular command sets, and has better visibility due to an optically matched lens and wider character pitch. Best of all, this premium pole display is also one of the most affordable on the market.